I moved to Walnut Creek in 1975 and around 1978/1979 I took a class at a now-defunct, very small quilting store (A Thousand Cranes). The class was to hand-piece 6 sampler blocks, one block every week. I don't think I knew too much about quilting at the time, although I had an extensive background in garment sewing. 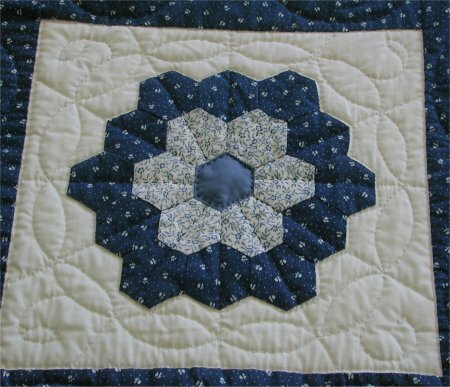 When the 6 weeks was done, we had done blocks that had curves (Drunkard's Path), a Bear Paw, a floral applique, an 8-point star, a Grandmother's Flower Garden and a pieced block with a "Y" seam. And then we were done. I don't remember if there was a follow-up class about what to do with the sampler blocks, but I certainly didn't take it if there was one. I had bought a book as a reference to help me at home with the hand-piecing. In this book was a wonderful setting layout that I greatly admired and so decided that I would use this layout for my sampler blocks. Unfortunately, there wasn't any instructions in the book on HOW to do that layout; there was just a picture of it. As I was putting the sashing together, I remember thinking that it didn't seem "quite right" but I didn't know why or how to fix it .. so I continued on. Eventually I finished hand-piecing the sashing and proceeded to hand-baste the sandwich together. At which point, I realized that I had NO IDEA how to do the quilting. I had no desire to hand-quilt it (I'm still not a fan of actually *doing* hand-quilting) and I sure didn't know about machine quilting, so I simply bundled it up and packed it away. 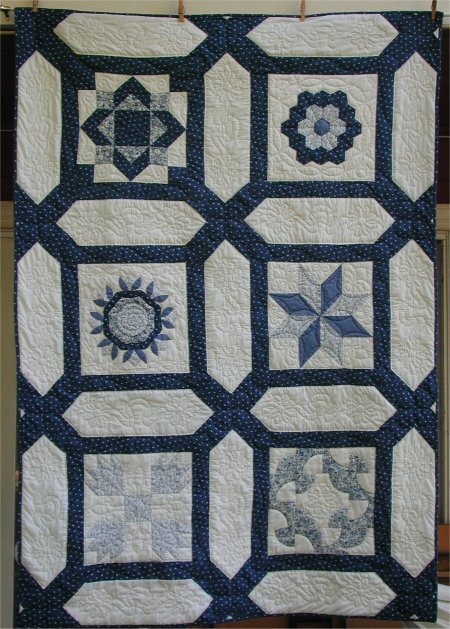 At the top of the UFO list was my hand-pieced sampler. I hauled it out of storage and really gave it a hard look. Dang. I did a GOOD job on all those blocks! The points were pointy! The intersections were exact! The "Y" seams were perfect! The applique was wonderful! Honestly, I'm not sure if I would be as careful *now* with my machine piecing! The sashing, however, was a different story ... I do have to sadly shake my head at the really bad job of construction .. the hand-piecing is good, but the way I constructed the sashing is very, very wrong. But ... it was the level of my competence at the time and I decided to leave it as is, rather than take it apart and re-do it. I also discovered that, at the time, I obviously didn't know about Following the Force ... pressing the seam allowance to the dark side. :-) When I was doing the stitch-in-the-ditch around the blocks, I found that at times, it was a SOTR ... Stitch On The Ridge!! Quilting in the lozenge shapes. It's 2 multi-looped bows with a twisted ribbon between them. However, I also decided that such good hand-piecing truly deserved to be accompanied by hand-quilting. Biting the bullet (because I *still* don't care to do hand-quilting), I began to mark the quilt sections with motifs for hand-quilting. I borrowed a round lap quilting frame (like a really big embroidery hoop!) from a friend and began to slowly, slowly, bit by bit, stitch by stitch plugging away at hand quilting this sampler. 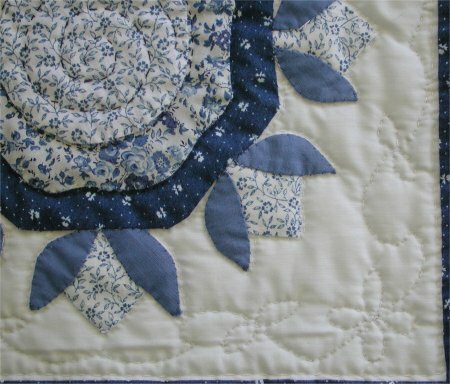 A delicate line of floral quilting in the corner of the applique block. I started to *try* doing the rocking stitch for quilting, but wasn't doing too well. The stitches on top looked "OK" but underneath, they weren't anywhere *near* the size as the stitches on top. It is my understanding that "proper" hand-quilting stitches are the same size that show on top of the quilt as on the back. So, I was getting kinda frustrated. 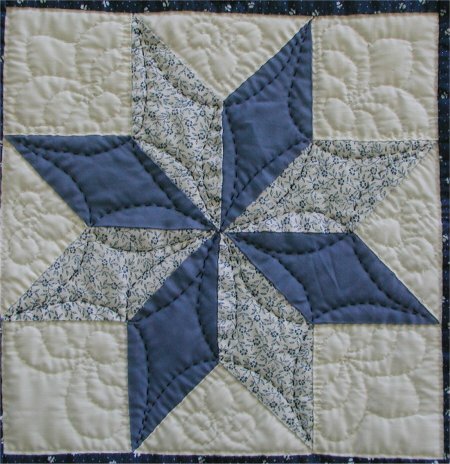 An 8-point star with contrast quilting thread and surrounding fleur-de-lis. Then I had a Light Bulb Moment (tm). I was using a hoop. Didn't I do needlepoint for years and years and years??? I figured since it was going to take me a year-and-a-day to get the hand-quilting done anyway and I wasn't trying to hurry it along, I could do the quilting THE SAME WAY I DO NEEDLEPOINT: double-handed! If you are unfamiliar with that technique for needlepoint, you put your dominant hand under the hoop (where it's hidden by the fabric) and your weaker hand on top (so you can see where you are putting the needle) and do a push/pull with the needle. Your hidden dominant hand really is quite smart about being able to push the needle up at precisely the point where you want it from underneath and you use your eyeballs to help your weaker hand to place the needle exactly where you want it on the top going down. The needle gets passed back and forth like a shuttle between the two hands. I didn't dare put it away even when new projects intervened because I was deathly afraid of "losing" the quilt one more time! It's taken me the better part of a year to do this small (45"x66") quilt due to the slowness of my hand quilting and the other projects that I was working on. HOWEVER ..... oh happy happy joy joy! .... it's done, it's done, it's done!!! I really am soooooooooooooooooo pleased with the result and very, VERY pleased this project can be finally marked as 'done'!